I too hate fresh tomatoes with 2 exceptions…salsa if its made in a blender with no chunks and bruschetta if its small chunks and even then sometimes the tomatoes taste is too much. I can’t wait to try this, never thought about roasting the tomatoes. Looks great! It’s always great to meet another tomato hater, lol. You will love this, the roasting mellows out the flavor and brings out the sweetness. Let me know what you think! 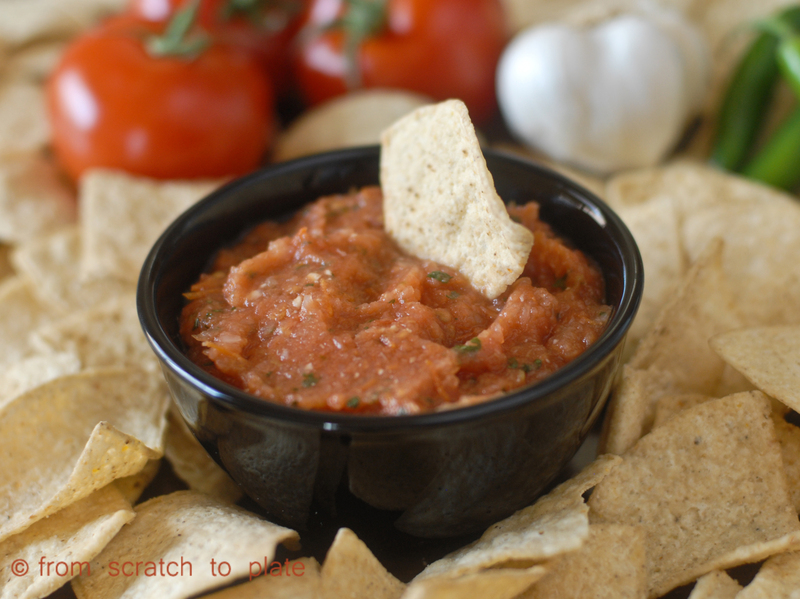 I wouldn’t say it’s a knock-off…but it’s the best homemade salsa I’ve ever had. Ooh, that was a big oversight, thanks for the question! I think about 45 min- an hour will do. It depends on how big you slice the tomatoes. Umm…I shouldn’t post while talking to my kids…what I meant was “it depends on how big your tomatoes are”. OK. This salsa, I am pretty sure I screwed up, but it was still AWESOME! I think I didn’t have enough tomatoes (I was estimating how many to get based off of what I thought I had at home). As soon as I was finished I thought I had put too much cilantro in (seriously an amazing talent that I have, specifically related to cilantro), but I poured into cleaned out applesauce jars and stuck it in the fridge. Well it took us 10 days to even try it, because of my refried bean fiasco (I burned my beans while on the phone with my mom – OOPS! ), and yesterday Justin wanted to open it up for his Fathers Day Enchilada’s and OH. MY. GOODNESS! It was delicious! We are in love. And the overly cilantro flavor from before was gone. So easy to make and so good to eat. We’ll be taking some salsa on our road trip this weekend for sure. And now I need to make more enchiladas because they are all gone… and I guess we should just call them baked burritos or something, because we used the salsa as the enchilada sauce. SO GOOD! Now I need to try that lasagna soup on the near future. Yea! I’m so glad you love it. It is seriously awesome. 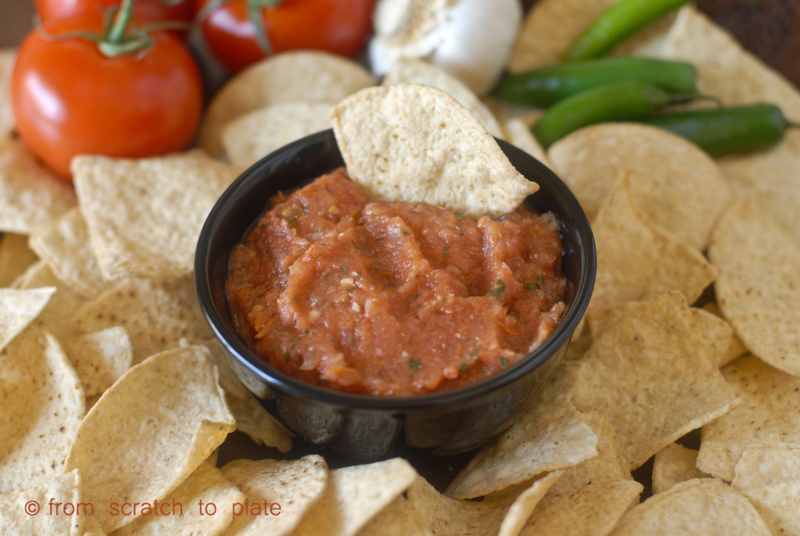 I made this 2 nights ago, it tastes much like the salsa at “On the Border,” my favorite! I do not care for it warm, like the original author suggests, but prefer it after a few hours when the flavor develop more. Fantastic recipe, thanks for your modifications, the spice factor is a little less spicey! This is a great addition to chicken enchiladas with sour cream chile sauce!